Ontario’s health privacy act came into effect a decade ago, and since then our office has worked to uphold its principles by issuing decisions, guidelines and training materials for health information custodians. The Personal Health Information Protection Act (PHIPA) is now recognized as a gold standard for protecting privacy while enabling the effective provision of health care. In fact, PHIPA has been viewed as such a success that it serves as a model both here in Canada and in the United States. Since 2005, we have issued 16 decisions under PHIPA. Early this year, the Commissioner called for changes to strength the legislation and, in June, the Ministry of Health and Long-Term Care announced it would move forward with our recommended amendments. Still, unauthorized access to personal health information (PHI) remains a challenge and addressing these remains a priority for our office. To ensure health-privacy complaints are processed in a fair and timely way, we continue to simplify our practices related to PHIPA. This goes hand in hand with clarifying and promoting how individuals can report health privacy breaches and access their personal health information. Another part of this work involves informing frontline heath care workers and the general public about the importance of secure PHI. 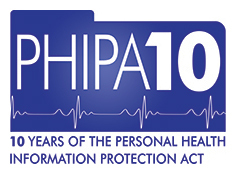 This past year we drew attention to the 10-year anniversary with the #PHIPA10 hashtag, sharing news and updates related to the Act and our work with it. In September we announced we would issue an expanded range of PHIPA decisions and follow a slightly different process when dealing with health-related matters. Ontario’s health-privacy legislation is poised for an update, and our efforts will evolve with it. After 10 years, we’re moving on from #PHIPA10 and launching Frontline #HealthPrivacy, a new program for health care workers and students. Through Twitter and our new Facebook page, we’ll share tips, news and updates, with the goal of fostering health-privacy conversations and community online. Stay tuned for more details about Frontline #HealthPrivacy in November.